I’ve long been looking for a good MySQL manager for Mac OS X since I’m not a big fan of phpMyAdmin and the other tools out there. Yes there’s always the command line too, but sometimes it’s nice to have a GUI for such tasks. Then I came across SequelPro recently and I think it might fit the bill. With it’s beautiful interface, you can easily connect to local or remote MySQL servers, easily run queries in it’s awesome query editor that’s complete with auto-completion, and everything else you’d expect. Development is ongoing so this already great app is only going to get better. The best part? It’s totally free and open source. 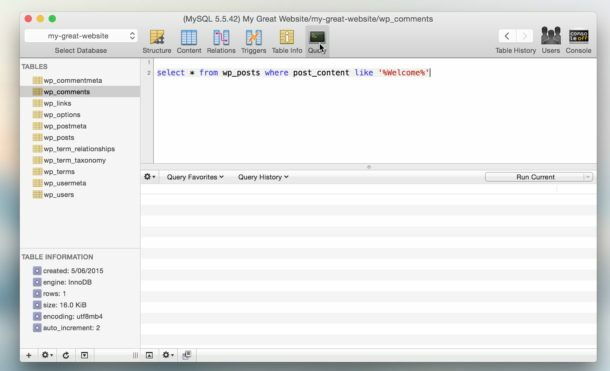 SequelPro may just be the best MySQL database manager for Mac OS X, if there is a better solution I haven’t found it yet! And yes, SequelPro works on all major versions of Mac OS X and Mac OS, including the latest and greatest! So whether you’re on an older system or newer one, if you want an excellent SQL manager in the GUI, check out SequelPro, it’s pretty nice. also for oracle,postgresql and sqlite. I personally think Navicat for MySQL is the best tool out there, but it costs money. I like SequelPro a lot, too. wth .. are those bots? i like it. Thanks for the hint! I use Valentina http://www.valentina-db.com/valentina-studio-overview, the program is free. It works on 3 OS: MAC, WIN, LIN. It works as with mySQL/mariaDB, so with PostgreSQL, SQLite and Valentina DB.